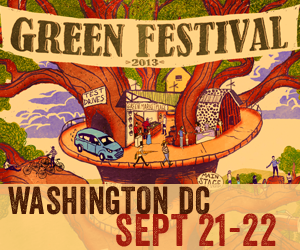 Next weekend, November 8-9, the Green Festival returns to DC with 350 exhibits, green shopping, community networking, organic food and beer, live music and much more. The festival is a joint project of Global Exchange and Co-op America, and all exhibitors must meet the standards set by Co-op America. There will be 125 speakers including Andy Shallal of Busboys & Poets, authors Marion Nestle and Barbara Ehrenreich, Honest Tea’s Seth Goldman, and Parin Shah (local policy director for Green Jobs for All). Festival attendees will be able to explore the latest in clean technology, green building, socially responsible investing, eco-fashion, renewable energy, green careers, natural foods, eco-tourism, and more. Don’t forget to bring your yoga mat so you can participate in the 50-minute classes held over the two-day event, as well as free 10-minute one-on-one sessions with Boundless Yoga founder Kim Weeks and instructors from her studio. Location: Washington DC Convention Center, 801 Mount Vernon Place (Mount Vernon Metro stop).